My edition: Paperback (proof), published on 29 January 2015 by Hutchinson, 289 pages. Description: Millie Bird is a seven-year-old girl who always wears red wellington boots to match her red, curly hair. But one day, Millie’s mum leaves her alone beneath the Ginormous Women’s underwear rack in a department store, and doesn’t come back. Last Bus to Coffeeville meets The Hundred-Year-Old Man Who Climbed Out of the Window and Disappeared in Lost & Found, which was an utterly joyful read and one I didn't want to end! Recently I have found that my taste in preferred novels has started to change, where I previously predominantly favoured women's fiction and YA dystopian titles, I've started to become more and more fond of literary reads and YA contemporary 'issues' books instead. These were genres I did already enjoy previously, but rarely made time for to pick up, however it's currently nearly all I read. I've particularly fallen in love with quirky literary titles, which Scandinavian authors seem to write so very well (it will be very hard for any books to beat A Man Called Ove and My Grandmother Sends her Regards and Apologises by Fredrik Backman as my favourites of the year), and Lost & Found by Australian author Brooke Davis falls right into that unique category. Millie Bird is a 7-year-old girl who one day is left behind in a shopping mall by her mother. This sounds like the start of an adult issues book but is in actual fact the beginning of a wondrous adventure that may have a heartbreaking message at its centre but is told with such a unique perspective and joie de vivre through the eyes of its young protagonist, and some elderly friends she meets along the way, that the reader can't help but be swept away by her boundless childish optimism and innocence, despite the actually rather unrealistic mission at the heart of it all. Millie is determined that her mother is still looking for her and so she leaves messages all across the shop she is hiding in to tell her where she is. On her days spend in the mall she meets Karl the Touch Typist, an octogenarian who has also made the shopping centre his home and the two strike up an unlikely friendship. Together with a plastic mannequin, nicknamed Manny, they decide to set out in the search for Millie's mother. Joining them on what turns into quite an absurd road trip is Agatha Pantha, a grumpy octogenarian who lives in the same street as Millie but hasn't actually set a foot outside of her house since her husband passed away many years before. 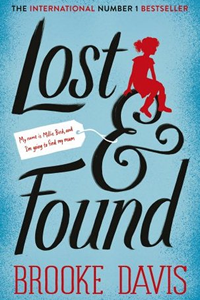 For a novel that starts with a little girl being abandoned in a shopping centre, Lost & Found was a surprisingly humorous and uplifting tale about a group of unlikely companions who each learn some valuable life lessons along the way. Even the octogenarians pick up a wise lesson, or two, showing that it's never too late to change for the better. Though despite the brilliantly quirky voice and whimsical escapades laced throughout, the novel also tackles some very serious issues, such as grief, loss and death; and it does so very honestly and with a lot of heart. The only thing that knocks this book down just a little from the 5 stars I would've given it otherwise was its abrupt ending. I didn't feel like the journey was over and I would've loved to have read more about Millie, Karl and Agatha. Other than that though, this was an extraordinarily written and heartfelt story. I was astonished when I discovered that this is actually author Brooke Davis' debut, written as part of her PhD at university. If her writing is already this good at the start of her career, I am very excited indeed to see how it will evolve and flourish in her next novel(s). Many thanks to the publisher for a copy of the novel through Lovereading in exchange for an honest review.